FIXED! Yay! Manage -> Settings -> Create a Custom Award has been replaced with Manage -> Settings -> Custom Awards, which is a list of all your custom awards. From there you can edit them. Also, custom awards are now listed in alphabetical order throughout the site. We just released a bug fix for adding bulk money transactions - saving transactions was failing. This is now fixed. Thanks to those who reported this problem. As we've mentioned before, we are busily preparing for an upgrade of the web application framework that powers TroopTrack. We released a bunch of code changes over the weekend that get us very close to being able to release the upgrade. Unfortunately, these changes broke your ability to update certain achievements. We just released a fix for this and you should be able to update all achievements now. - Require members to pay credit card processing fees? - Allow members to pay fees with individual money accounts? - Allow members to pay fees with credit cards? So... if you had all three of these turned on, a member would be assessed a credit card fee even if they were paying with a money account. This is now fixed. We just released two significant changes to event payments - if you use this feature you have probably wanted these two changes. 1) There is now a payment setting that allows you to prevent members from purchasing event tickets using a money account with insufficient funds. You need to change this setting if you don't want to allow members to overdraw accounts. 2) If you allow event fees to be paid with money accounts and PayPal or Stripe, users will now be able to choose which payment method to use when they RSVP. Many of you have asked us for these two features and we hope you are pleased to finally have them! 1) If you have multiple people in your troop with the same email address (this happens a lot in families) there was a chance that some of the youth in the family would not show up in the newsletter. This is fixed. 2) In some cases, the start achievements button on user profiles was crashing. No more. 1) Sign up sheets are now created in "draft" mode. Emails are not sent out until you hit the publish button. 2) Check lists are now created in "draft" mode. Emails are not sent out until you hit the publish button. 3) We fixed a bug that was preventing you from saving changes to the awards used by your unit and we renamed the menu item from "Awards in Use" to "Active Achievements". 4) We made some changes to our calendar feeds that we hope will improve time zone determination for Microsoft Outlook users. 5) When a scout "ages out" we stopped displaying leadership positions they held as a youth. This is no longer the case. Good morning! We just released two significant changes. 1) We've added support for Google Analytics, a tool that will allow you to see how people use your TroopTrack account. You will need to sign up for a Google Analytics account to use it, but once you've done that you can go to Manage -> Settings -> Edit Troop Settings and then click on the Webmaster Tools tab. 2) We have re-designed the way user information is edited to make it more secure and to account for the varying ways different organizations allow that information to be changed (BSA, Trail Life, AHG, etc each have different information in the profile and some have rules about who can change it). You will now see edit links near each section of the profile instead of one huge form with everything on it. 1) We added support for Google Webmaster Tools. Now you can have greater control of how your TroopTrack web site looks in Google search results, how it's indexed, and more. Just go to Manage -> Troop Settings and click on the Webmaster Tools tab to set it up. 2) We moved settings related to how your web pages look to the new Webmaster Tools page. 3) We improved name matching on one of our data importers. 4) We fixed a couple of errors related to editing troop settings. 5) We updated the newsletter to consistently show events coming in the next 30 days. 2) We now repeat the merit badge header on additional pages of the eagle report. Behind the scenes, we continue to make updates in preparation for the Rails 5 upgrade mentioned previously. Well, for the first time in a really long time we've gone 30 days without posting a product update. Please don't think that means we haven't been hard at work - we have in fact been very busy. Unfortunately, most of the changes we've been making have been things that aren't easy to see. I'm going to take a minute to explain, and then I'll list the changes we've made that you can see. TroopTrack is based on a web application framework called Ruby on Rails (Rails, for short). This framework provides a lot of awesome features from security to database integration and more. Every now and then a new version of this framework is released and that usually means we have to make some changes on our end to be compatible with the new version. We work really hard to make sure that we never fall behind so that you always have the latest, most secure version of Rails. Rails 5 was released last week. We knew this was coming and we are extremely excited about it. It has several new features, such as built-in web sockets, that we will be able to use on our never-ending quest to be the best scouting software on the planet. One of the changes in Rails 5 is related to form security - this is a feature that prevents users from manually adding data to forms and then tricking our servers into saving changes they aren't allowed to make. Rails has made an important change to this to make it easier to use. This change, while extremely valuable, also means we need to make a pretty big number of changes on our end. And that's what we've been working on. Spencer and Ryan have been leading the charge on this and so far they have submitted more than 50 "pull requests" (a pull request is a set of code changes that accomplish a single thing). I've been working on other smaller changes related to the Rails upgrade. In other words, we've been doing a lot. Unfortunately these changes aren't visible to users, kind of like replacing the pipes in a house. As long as we don't break anything, you aren't likely to notice. We added West Central Wireless and Consumer Wireless to the list of carriers we support for text messaging. I'll try to be better about keeping you posted on changes from now on. Have a great summer! 1. Record attendance now lists all past events by default and you can define your own date range for events to show. 2. Certain user profiles were crashing. This is fixed. 3. In some cases empty patrols were disappearing. This is fixed. 4. We made multiple improvements to the efficiency and accuracy of displaying members by patrols in various places. 5. TurboNET roster import now imports adventure loops and pins. 6. We improved our automated integration test suite that runs every time we change the code so that it has broader coverage of TroopTrack features. 7. In some cases the app would crash when you edited vehicles. This is fixed. 8. We made numerous improvements to public events, an alpha-only feature that isn't yet available to everyone. The general idea here is that you can sell tickets to an event directly to the general public, not just members of your troop. 9. The troop documents page was crashing for certain users. This is fixed. 10. For AHG troops, the achievements tab on the user profile now defaults to the current level of the girl. 11. We now remove blank categories from the troop document category list. 12. Users can now edit and delete vehicles they own, regardless of privileges. 13. Our staff now have the ability to quickly un-merge user accounts as needed. 14. We've improved the integration between TroopTrack and Community in multiple ways. 15. Double-clicking on certain menu items was causing errors. This is fixed. 16. We fixed the calendar ICS feed to use troop timezones. 17. If a user had an assignment on a check list or sign up sheet and the user was deleted, the sign up sheet/check list would crash. This is fixed. 18. We updated our contact page to reflect recent staffing changes we have made. 19. If you click on a link to a private web page and you aren't logged in, it will redirect you to that page after you log in if you are a member of the troop. Otherwise it will redirect you to the public web site. 20. A troop can now choose whether PayPal/Stripe transaction fees are paid by the troop or the member making payment. This is under Manage -> Settings -> Payment Settings. 21. If a user only has one type of achievement on their profile, we no longer show achievements as a tabbed view. 22. Previously a user could add guests to an RSVP without indicating whether they would be attending or not. This is no longer allowed. 23. Previously a user could add a negative number of guests when they RSVPd. No more. 24. Some events were not showing up on newsletters. This is fixed. 25. Event agendas were running off the page when printed. Fixed! 26. The year-at-a-glance view was hard to read, so we made the table striped. 27. You can now choose to see empty households on Manage -> Members -> Households. 28. Event messages could not be sent for events that don't require you to RSVP. This is fixed. 29. LDS troops were unable to add Varsity and Venturing awards. This is fixed. 30. We've improved the instructions for printing award cards on our perforated card stock. 31. We've added the product updates listing back on the main site as well as community. 32. Meeting schedules now have a rich text editor for the description field. 33. Upgrading or downgrading completed BSA ranks now preserves the completed on date of the award. Phew. I'm spent. Have a great weekend. We just released a bunch of fixes thanks to @Spencer, who is working full-time at TroopTrack over his summer break and is totally crushing it! I'm thinking of calling it the "Summer of Bugs", ie. the summer of killing lots of bugs! 3) The Record Attendance page now includes all past events and you can define a date range for it. 4) There was a bug allowing people without the proper privileges to delete achievements. This is fixed. 5) There was a bug allowing people without the proper privileges to add training. This is fixed. 6) We now use https for this community site, so all traffic is now encrypted. Yay! Also, some time ago I talked about supporting selling tickets to an event for the general public. We are currently testing that out with our summer codecamp. You can check it out here: http://codecamp.trooptrack.com. Just don't register. Unless you want to send your kid to Weatherford for a week this summer! Typically you only want to downgrade or upgrade a BSA rank if they haven't been started, but we've run into circumstances where you have needed to up/down grade a rank that has some progress. The main page still defaults to showing only the unstarted ranks, but there is now a link on the page for showing all ranks. Be careful - you will lose all progress when you upgrade or downgrade and we can't bring it back!!! You have been warned! 1) After you record attendance at an event you can record progress on an award for everyone who attended. Just click on Attendance -> Record Progress from the event details page and it will start the record progress workflow. 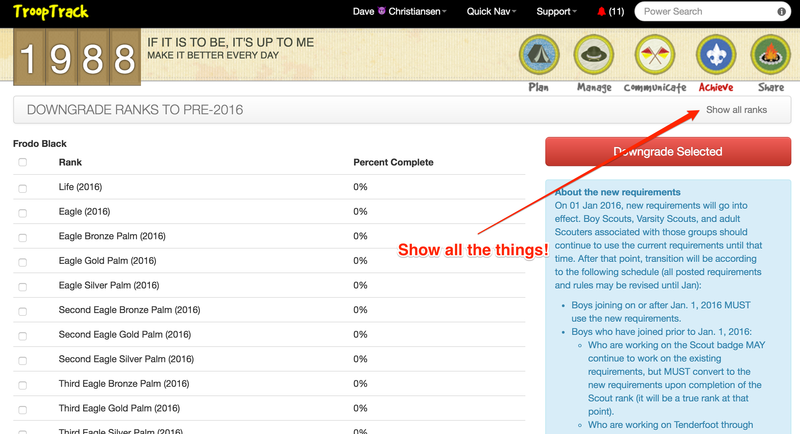 Note: Since TrailLife troops have a custom version of record progress, this feature is not available yet for them. 2) Some users were having troubling using an external web site for their public web site depending on whether "http://" was included when they edited the setting. We have added some code to fix broken web sites and to require troops that use this setting to include the https from now on. 3) Some users don't have households, and as a result were not able to RSVP for events. This has been fixed. 4) We have added support for sending text messages to GCI customers.